Grave Tusk is the second Tusk in Donkey Kong Jungle Beat. He is the ruler of the Grape Kingdom in the GameCube version. In the New Play Control! version, he is the ruler of the Cherry Kingdom. 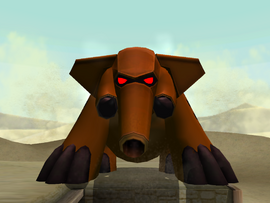 He appears as a large, robotic elephant, colored brown, with red eyes and darker brown tusks. Grave Tusk is fought much the same way Turret Tusk and Torch Tusk are fought. At first, he has the same attacks as Turret Tusk, but after enough damage is done to him, he gains a laser attack. The only way to dodge this attack is to get into a corner that the laser will not hit. Again, Donkey Kong must throw Blood Pines at him to reveal and attack his heart. Grave Tusk seems to be fought in the desert. Kiku Zō Listening Elephant, kiku meaning "to listen". The textures of Grave Tusk and Torch Tusk are internally swapped, suggesting they were meant to be encountered in opposite order. This page was last edited on January 28, 2019, at 03:01.